Höfn in Hornafjörður is a lively fishing town with a population of 1,800, and it’s a gateway community to Vatnajökull National Park. 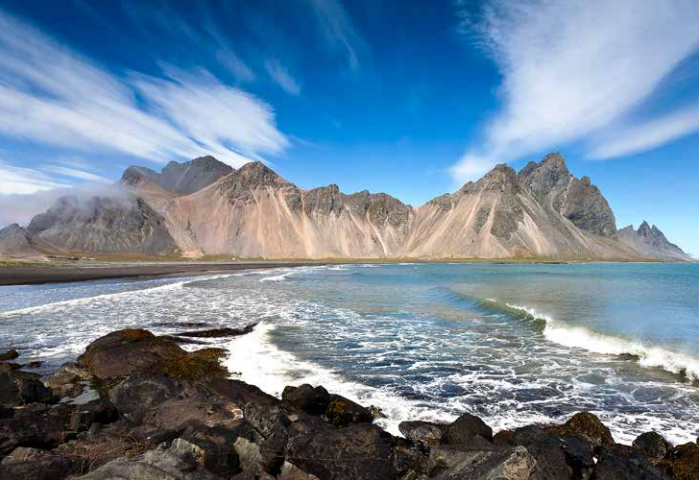 With its extensive fishing industry it is also famously known as the lobster capital of Iceland, offering diverse lobster dishes and celebrating an annual Lobster festival. This thriving town is now welcoming more and more foreign visitors each year. Höfn and the surrounding area offer a range of activities and excellent restaurants that serve local cuisine. Be sure to ask for the local beer Vatnajökull, which is brewed from the icebergs of Jökulsárlón with the local herb arctic thyme. Höfn plays the role of a service centre to those visiting the major tourist attractions in the vicinity. The area has successfully promoted itself as The Vatnajökull Region and is proudly attracting everything from leisure tourists to edu-tourists, cruise ships and film crews. Movie filming and advertisement shooting has been popular in the area because of its diverse glacial landscape and accessibility all year long. From the port of Höfn, visitors are within sight of Vatnajökull, Europe´s largest glacier. The town is a great base for exploring the magnificent lands of Vatnajökull National Park. Be sure to drop by at the park’s Visitor Centre in the beautiful historical building, Gamlabúð, by the harbour. The Vatnajökull Region spans over 200 km of the Ring Road in the southeast of Iceland. This is one of the most spectacular and special parts of the island. Here you can find glacier tongues resting on the green fields of the lowland, incredible glacial lagoons with floating icebergs, the highest peak in Iceland and Jökulsárlón the deepest lagoon in the country. Experience black sand beaches, colourful mountains and deep valleys in one of the best trekking areas of the island, as well as rich birdlife, reindeers and seals. Enjoy the best access to Vatnajökull National Park, one of Iceland’s most extensive protected areas. Photography enthusiasts should find the Vatnajökull Region particularly delightful, as it provides countless magnificent views of glaciers and mountains in the 24-hour daylight in the summertime. This rich nature together with very good tourist services make the region one of the most interesting and most visited areas of the country. What is so special about the South East? The area is dominated by the great Vatnajökull, the largest glacier in Europe (8000 km2) and the third biggest in the world. Vatnajökull has sculptured the landscape in many ways; various glacier tongues, glacial valleys, glacial lagoons with spectacular floating icebergs, etc. Numerous volcanoes lie under the ice, creating the dramatic co-existence of ice and fire. The glacier has also created a special way of living and its own culture because nowhere else in Iceland has man needed to adapt so deeply to changes in climate, with colder climates in the past and global warming in the present. This used to be the most isolated part of the country, closed between glacier tongues and impassable glacial rivers.